This is a listing for a reprint of a vintage Paris poster calendar page May 2011 from the Cavallini Archives. 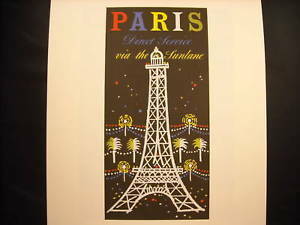 It says "Paris Direct Service via the sun lane" with a night time image of the Eiffel Tower with multicolor lights and text. Its striking design is printed on nice matte, textured paper. The measurements for this item is 19 inches by 13 1/2 inches.